We are an international Executive Search and Selection consultancy based in London. We specialise in recruitment at Board and Senior Executive level in the Commercial, Not-for-Profit and Education sectors, and are supported by a wide international network of associate offices. 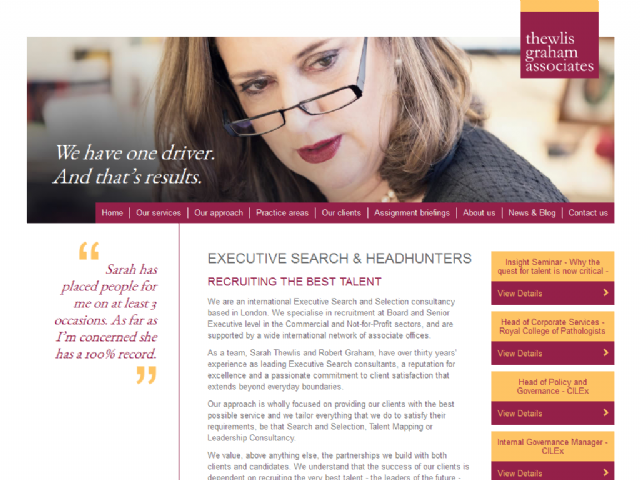 As a team, Sarah Thewlis and Robert Graham, have over thirty years’ experience as leading Executive Search consultants, a reputation for excellence and a passionate commitment to client satisfaction that extends beyond everyday boundaries.